I took some time about reading Fred Turner’s From Counterculture to Cyberculture. It appeared on my desk when I was working at openDemocracy, which is at least two and a half years ago, and most likely more. The feeling I got when I received it has never left me: that this book was a secret messaage sent especially to me. Nonetheless, it took me this long to read it, mostly because it is written densely, in an academic style. Fred Turner is assistant professor in the Department of Commnuication at Stanford University, at least he was at the time this book was published (2006). Perservering with his book has paid off. The book tracks a period of time between the early 1960s and the late 1990s, focussing on the activities of Stewart Brand and the communities he encountered during his extensive career as a social entrpreneur, from his experience with the Merry Pranksters to his founding of the Whole Earth ‘Lectronic Link, an early San Francisco-based BBS. 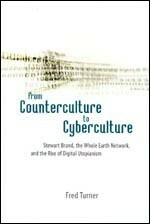 The books is subtitled “Stewart Brand, the Whole Earth Network and the Rise of Digital Utopianism”. In particular, Turner demonstrates how Brand brought to a popular audience the activities of both the New Communalist, back-to-the-land movement and the experiments in distributed computing of the latter day Cold War military-academic-industrial complex, using the common contact language he established to do so in order to frame an early, influential strand of information politics which extended to liberal economics, workforce reform… and the dotcom crash. I’d like to do another blog poast about that shortly. But in the mean time I suggest you swot up here.